LEXINGTON, Ky. (May 14, 2018) -- Cameron Stribling’s young life is about to change dramatically, just as she has planned. An early December 2017 graduate of Lexington’s Henry Clay High School and Locust Trace Agriscience Center, 17-year-old Stribling has been named the winner of the University of Kentucky’s 2018 Jamal Mashburn Scholarship. She will receive full tuition as a freshman at UK in the upcoming fall semester. She is the daughter of Carla Jordan of Lexington. Admitting to being “directionally challenged,” she is a bit nervous about finding her way around UK’s campus. But academically and professionally, this amazing young woman knows exactly where she’s going because she has her future all mapped out, at UK and beyond. Stribling was born in Michigan, but moved with her family to Lexington when she was 8 years old. Perhaps inspired by the verdant beauty of the Blue Grass State, she quickly developed a passion for plants. That love “continues to thrive today,” said Stribling. Her interest in plants grew at Locust Trace, where she accepted a leadership role in its Future Farmers of America chapter. After taking several classes in greenhouses and nurseries at Locust Trace, she was certified in plant sciences. But even her studies at Locust Trace weren’t enough to satisfy Stribling’s thirst for knowledge. She took a part-time job – that has grown to 35 hours per week -- at Wilson Nurseries in Lexington to learn even more about the art, science, technology and business of growing plants. 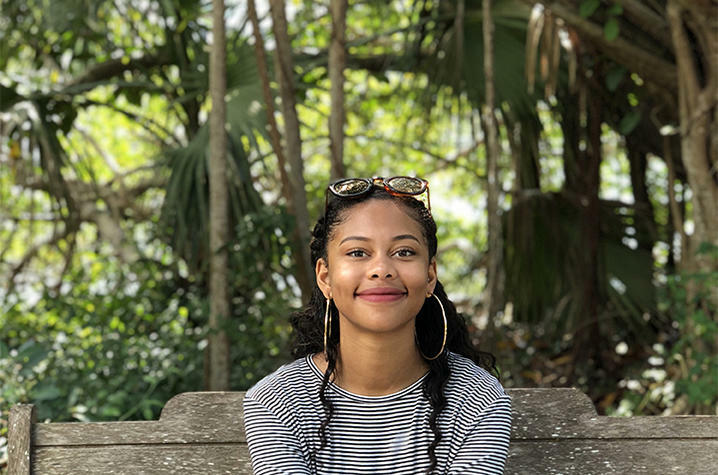 That love for everything green and growing will be gratified, as she plans to use the Mashburn Scholarship to major in horticulture with a minor in plant and soil sciences in the UK College of Agriculture, Food and Environment. “As a (UK) freshman, I will continue to develop my agricultural knowledge and professional skills. I plan on being the freshman representative for UK’s six-time national championship winning MANRRS chapter,” said Stribling. Minorities in Agriculture, Natural Resources and Related Sciences, or MANRRS, is a national non-profit organization that promotes academic and professional advancement by empowering minorities in agriculture, natural resources and related sciences. MANRRS offers students opportunities to enhance leadership and organizational and public speaking skills, and to experience professional critique of scholarly work in a “user friendly” environment. A few weeks ago at the MANRRS annual conference, the UK College of Agriculture, Food and Environment’s MANRRS chapter was named National Student Chapter of the Year for the sixth consecutive year for its community service, fundraising, executive board commitment, community engagement and more. The scholarship program that will allow Stribling’s dreams to come true was created long before she was born, in 1992 by former Kentucky basketball All-American and NBA star Jamal Mashburn. Mashburn was the fourth-leading career scorer for the UK Wildcats and a consensus First Team All-American by his junior year. He went on to play professionally and retired from the NBA in 2006 with career averages of 19.1 points, 5.4 rebounds and 4.0 assists per game. After his athletics career, Mashburn worked as an analyst for ESPN and launched a number of successful business ventures in Kentucky, including Outback Steakhouse and Papa John's franchises and car dealerships. Mashburn explained the reason for his decision when the scholarship fund was established. “I want young people to have a way to make it, just as I was guided through high school and got a scholarship. That has changed my life. I want to say to these young people, if you meet the program requirements and graduate from high school, there is a scholarship waiting for you at the University of Kentucky,” Mashburn said. A collaboration between UK and Fayette County Schools, the Jamal Mashburn Scholarship Program was designed to help and to support promising underrepresented students in Fayette County high schools. Applicants have to meet a multitude of requirements, including grade-point average, educational achievement and financial need.